When I was training as a chef in Ballymaloe Cookery School, Darina Allen taught me how to make this spectacular bowl made of Ice. It is a dramatic yet effective way to present dishes and keep them chilled at the same time. Perfect for scoops of ice cream or chilling dips to accompany Veronica’s snacks. Get two bowls, one about twice the size the size of the other. Half fill the big bowl with water. Place the second smaller bowl inside the larger bowl until the rims are level. 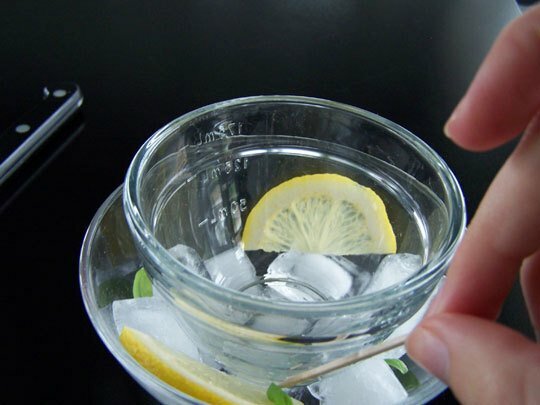 Weigh the inner bowl down with ice cubes, bag of ice or even some coins. Tuck some leaves or flowers or even lemon slices in between the two bowls, these will be suspended in the ice bowl and give an even prettier feel. 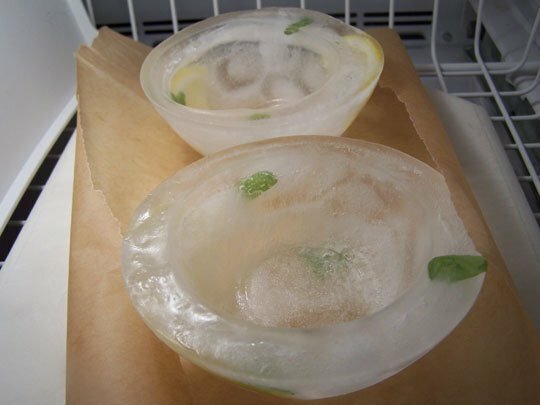 Put the bowl in the freezer, if necessary re-adjusting the position of the small bowl as you put it in. After 24 hours remove it from the freezer. Leave it defrost for 15-20 minutes, by which time the small bowl should come out easily. Then try to lift out the ice-bowl. It should be starting to melt slightly from the outside bowl, in which case it will slip out easily. If it isn’t, then just leave for five or 10 minutes more. Don’t attempt to run it under the hot tap, or it may crack. If you are in a great rush, the best solution is to wring out a tea-towel in hot water and wrap that around the large bowl for a few minutes. Put your dip in the bowl. Put a folded serviette under the ice bowl on the serving dish to catch any drips. At Christmas time, you might want to decorate with holly and in the summer with flowers. Enjoy, your friends will be very impressed. Very cool, I made it and put loads of red berries it in it and it looked fab. Hi Lynn, Did you? We’d love to see a picture :)! I bet people were impressed! !